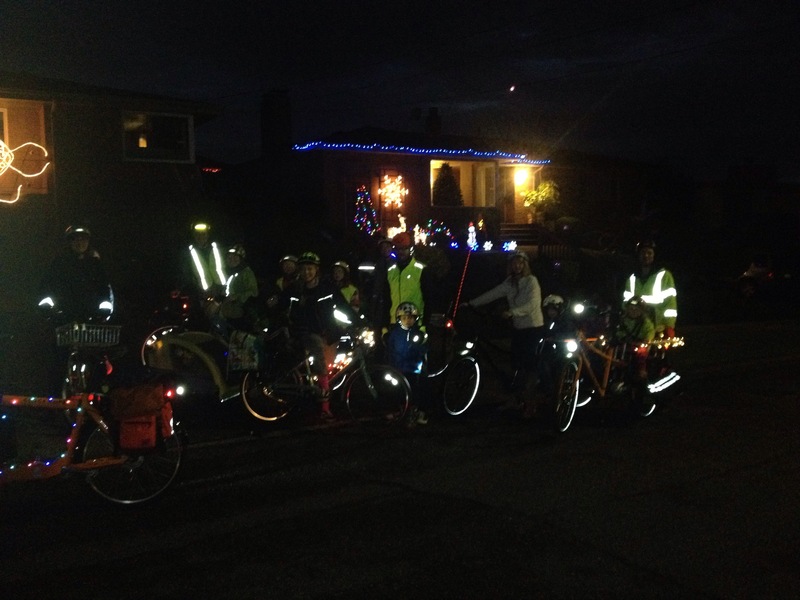 This was our third group ride (Critical Lass in 2012 and Kidical Mass in 2013) through the Olympic Manor holiday lights. 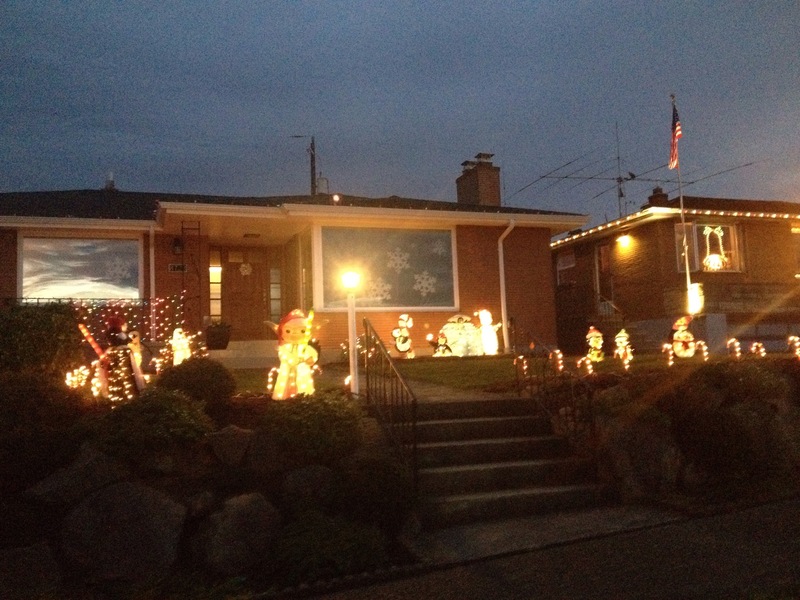 Last year proved a little early in the season and not all the houses were decorated, so waiting until the 21st this year worked out well. 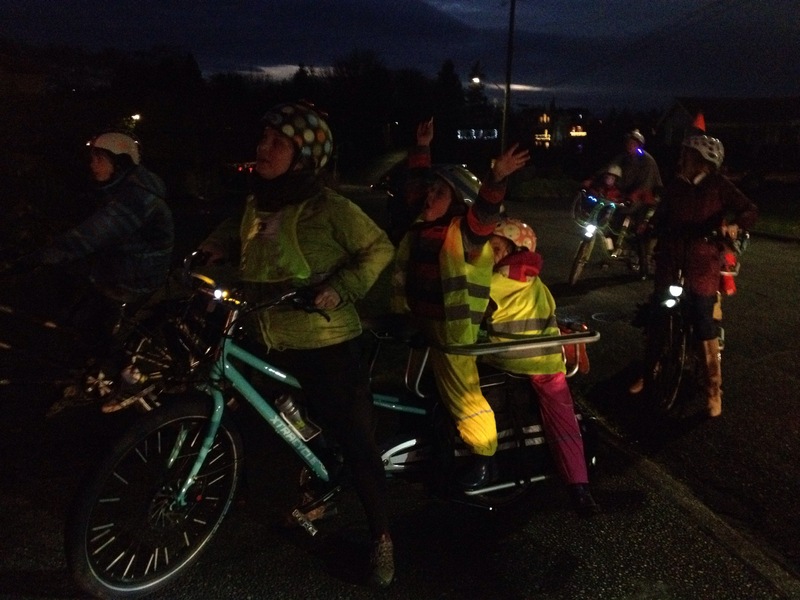 Plus, the kids got to shout “Happy Solstice!” to everyone in addition to “Merry Christmas!” and “Happy Chanukah!” The weather was perfect and we had 20 participants. My original plan was to leave home early in the day, like last year, because it’s difficult to rally to get out the door once it’s late in the day and dark. However, a sick five-year old kept us home all day (he slept from 5:00 p.m. Saturday to 2:00 p.m. Sunday!) so rather than cancel the ride, I opted to take the old mamabike and stick him in the trailer with a blankie and stuffed animal. He was eager to hang out and stay awake for a while so it worked out well. Thank goodness my seven-year old is still light enough that he fits in the Bobike maxi rear seat. But I have to admit this setup was pretty heavy for the eight-speed Bianchi Milano and gave me a reminder how much I respect those with insufficient gear range for our hilly city and/or those saving up for electric assist bikes who are struggling for the time being. 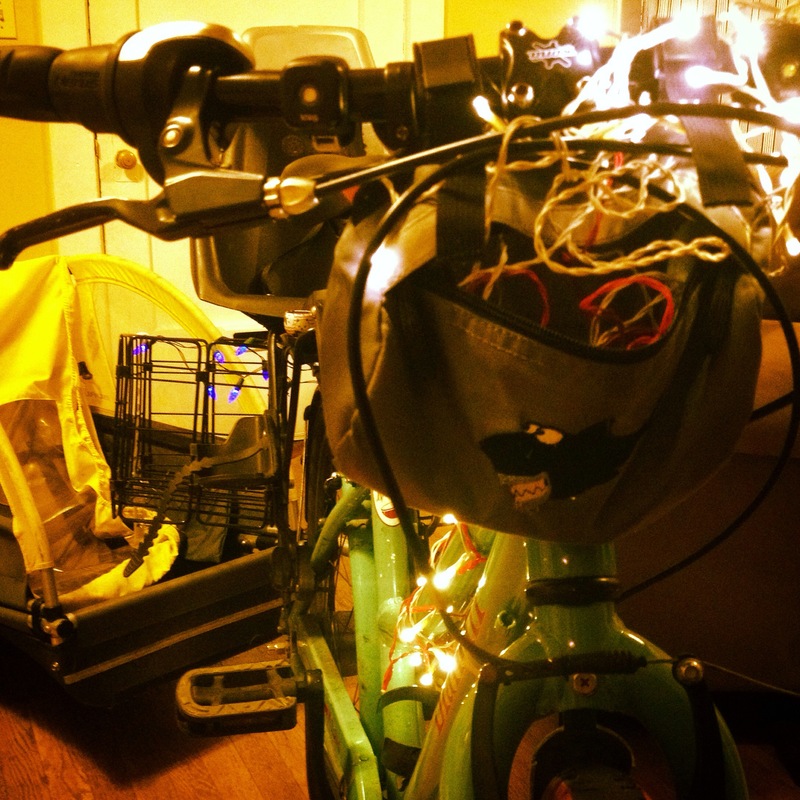 Part of the fun of a holiday lights ride is stringing extra lights on one’s bike, but due to the last-minute vehicle change, I tossed on what leftover battery-operated lights I could find before rushing out the door. I attached my seven-year old’s shark handlebar bag to hold the battery packs and wrapped red and white strands around my top tube, candy cane style. These lights aren’t waterproof, by the way, but they’ve lasted a few seasons, which is apparently not bad per Car Free Days: Light Up Your Bike with Battery-Powered-Holiday-Lights one- or two-season light estimate. The little white and red lights are from Ikea and the blue lights on my rear baskets are from Bartell Drugs. The timing worked well this year, we gathered at the playgroud at Loyal Heights Community Center at 4:00 p.m. while it was still a bit light out so we could see one another and I could get some pictures of the bikes. All my pictures are here in the Flickr gallery. I was fifteen minutes late to the park–oops–so we probably ended setting out around 4:45 which proved perfect. 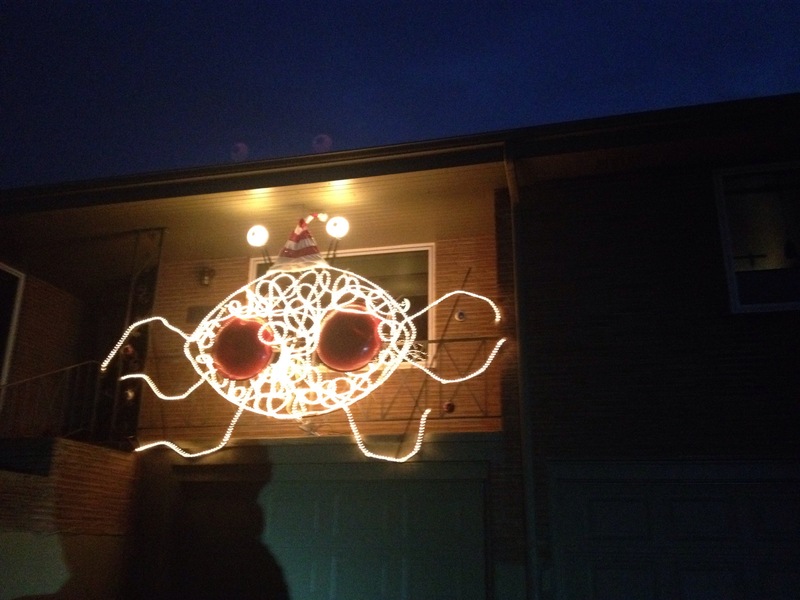 And my favorite, the Flying Spaghetti Monster in Santa hat. Behold the FSM! 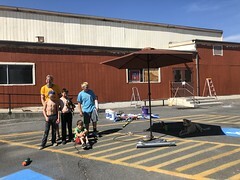 The kids were all impressed, too. We arrived to Grumpy D’s Coffeehouse at 5:30 p.m. There’s a warm fireplace near a group of comfy chairs, plenty of table seating, and toys! 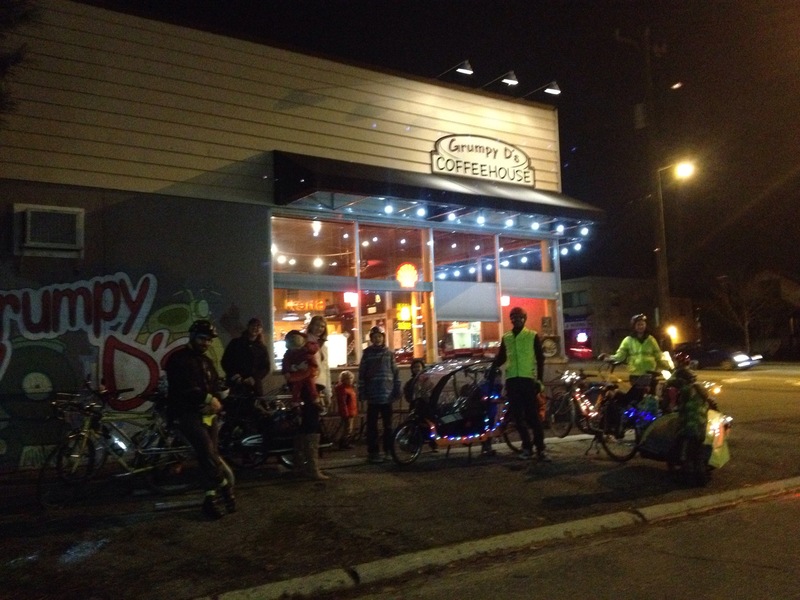 I didn’t stay for the afterparty this year due to sick kid, and three other families peeled off during the course of the ride as they got close to home, but several families stayed for peppermint hot chocolate and other treats. After getting the ride a bit lost last year which resulted in us doing the loop in the opposite direction and climbing a huge hill, I decided to up my route map game a bit. My regular system is a bit convoluted: I take a screen shot of my Google map directions and paste it into Photoshop where I type in each street name REALLY BIG so I can see it on my small phone screen easily. Then I email the image to myself so I can download it on my phone. My old system was to just save the image to my camera roll, but then as I take pictures during the ride I have to scroll farther and farther back to see the map. So this time I set it as my lock screen and could see it with just a quick push of a button! And with this and checking our position on the real map, we stayed on course. 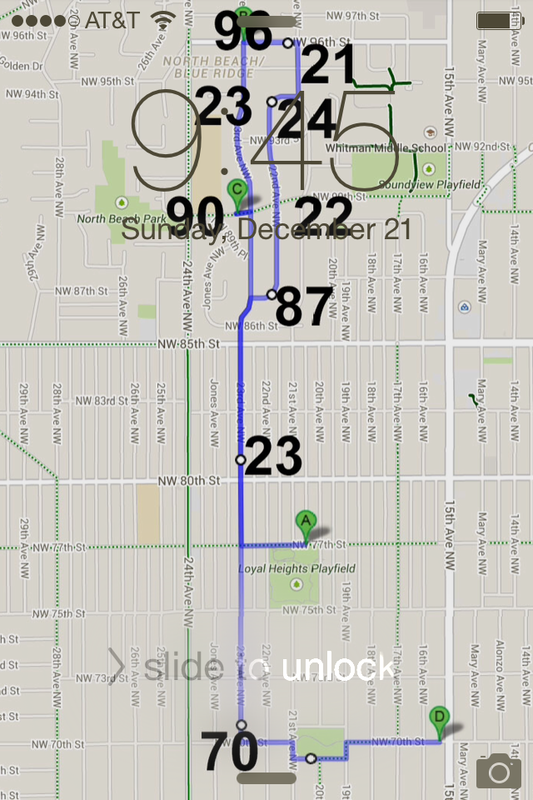 However–and this is mainly a note to myself for next year–we’ll turn off at NW 95th Street next year. Riding down 96th afforded us a beautiful view of the Sound, but it’s a busy street without any spectacular lights we would have missed. Plus we’d cut out one uphill block of 23rd by turning earlier. Everyone seemed fine with the amount of hills–it wasn’t too hilly of a ride, but it’s nearly impossible to avoid some climbing in Seattle. 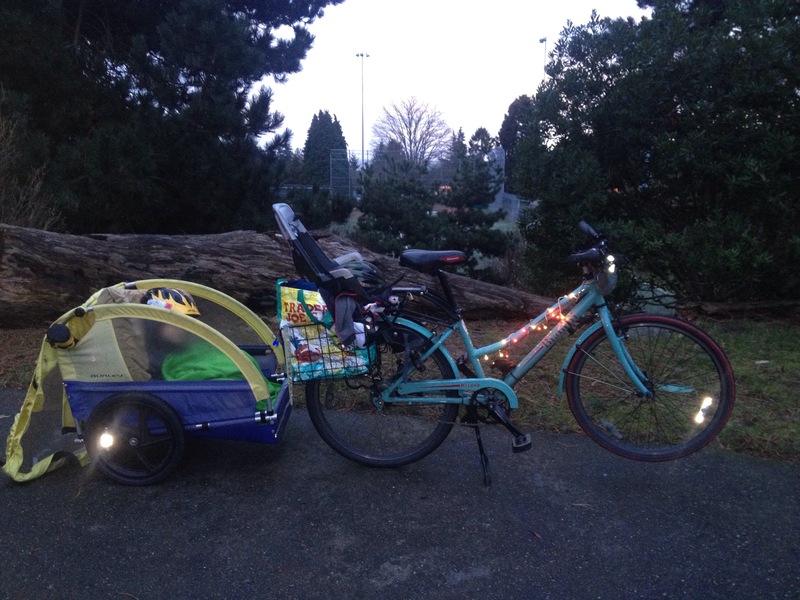 The three Xtracycle EdgeRunner longtails had BionX electric assists and the Larry vs Harry Bullitt longjohn had an Ezee front hub assist, but the two regular bikes, the Yuba Boda Boda midtail, the tandem, and my rig were regular ol’ pedal-and-sugary-candy-cane powered. ← Happy third birthday, Big Dummy!